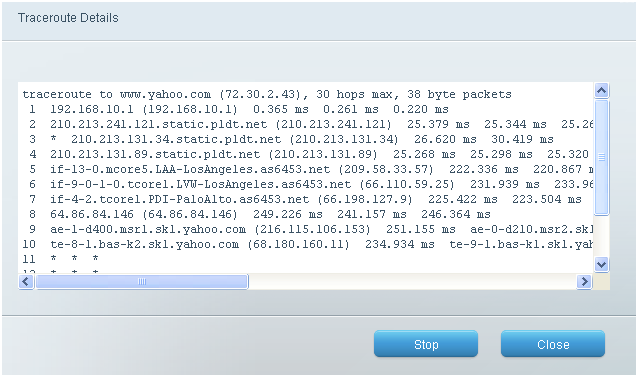 Traceroute is used to "trace the route" across an Internet network from your home router to a remote location specified in the IP or URL address box. Traceroute is important since it lists all routers and networks the data passes through until it reaches the final IP or URL address. This helps to determine how far data is getting before it either fails or reaches its destination. This article will discuss the steps on how to perform a ping test on the Linksys Smart Wi-Fi Account. Follow the steps below to learn more. Launch a web browser and access your Linksys Smart Wi-Fi Account. To learn how, click here. Enter the IP or host name you want to test. Click on the button to run the test. NOTE: The Trace route page shows if the test is successful. It will also allow you to see the path your packets pass through over the Internet.